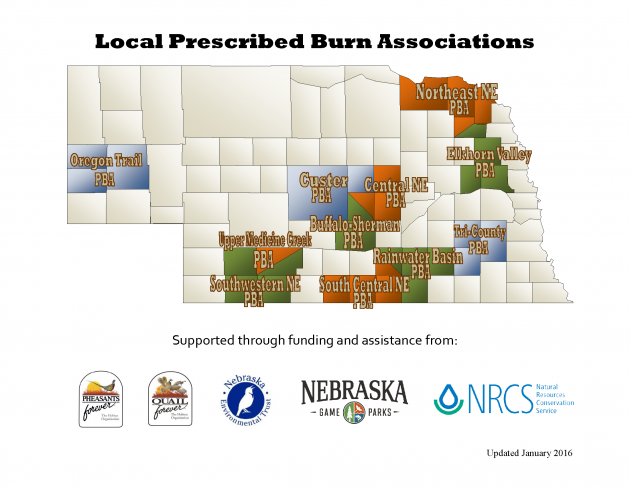 Pheasants Forever helped form local Prescribed Burn Associations (PBA) throughout Nebraska to help overcome the three recurring limitations: adequate knowledge, equipment, and assistance for prescribed burning. Burn association members must attend a basic burn workshop and participate in at least 1-2 burns each year. While private landowners often request assistance in completing CRP management burns, prescribed burn associations are not a work-for-hire operation. Rather, their success relies on a neighbor-helping-neighbor model. Using grant money from the Nebraska Environmental Trust, Pheasants Forever developed mobile prescribed burn units for every burn association, complete with $28,000 worth of burn equipment. The units have basically everything you would need for a safe and effective prescribed burn in a grassland environment: drip torches, skid sprayers, hand tools, radios, protective clothing, etc. Interested in joining a prescribed burn association? Locate the appropriate membership information below. Some PBAs are active in bordering counties. If there is no prescribed burn association in your area and you want to be involved, you’re not alone. Pheasant Forever is always seeking new contacts to help grow the prescribed fire community in Nebraska. For more information contact Prescribed Fire Coordinator Brian Teeter at bteeter@pheasantsforever.org or (402) 219-2572.